EzzyTech Networks Review 2019: Is EzzyTech Networks a Good Hosting? EzzyTech has been in the web hosting business since 2014. With its fully managed VPS servers located in the United States, the Bangladeshi vendor is well equipped to offer a variety of hosting solutions including shared hosting, reseller, dedicated, and managed VPS hosting solutions. EzzyTech is a Bangladesh-based web hosting provider established in 2014. The vendor specializes in providing fully managed hosting services backed by two data centers located in Dallas and Los Angeles in the United States. The vendor prides itself on providing secure and reliable hosting solutions operated on RAID 10 SSD cloud servers. In addition, EzzyTech provides fully managed VPS and dedicated server solutions. EzzyTech hosting plans run only on SSD servers, which ensures that all of the websites hosted record faster page loading speeds. All of its dedicated servers include full root access for easy and secure management including reboots and re-installation. This vendor’s hosting solutions use the CloudLinux operating system to improve server density, security, and density by isolating each user and supplying their website with the allocated server resources. 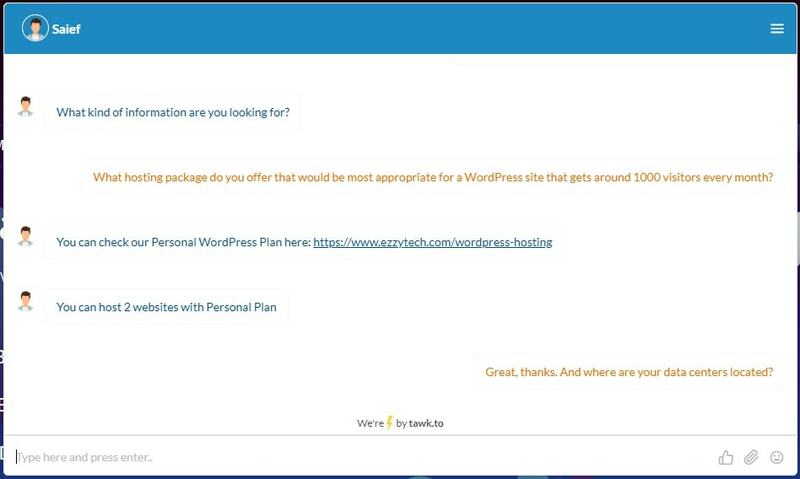 The Speed Booster plugin included in this vendor’s cloud hosting plans caches core files and database requests to the vendor’s database and makes websites run more efficiently. What’s more, the LiteSpeed web servers guarantee faster loading speeds for all websites hosted. EzzyTech’s most advanced packages are dedicated Intel Xeon E3 and Dedicated Intel Xeon Scalable 4110. Its Managed VPS solutions run on Linux operating system. EzzyTech’s fully redundant network is specially designed to deliver high uptime. In addition, it offers a free daily backup solution as well as free restoration, making it easy to restore your website following a disaster. EzzyTech web hosting solutions are reasonably priced. The vendor offers monthly billing cycles. Hosting prices are listed in dollars. This hosting company offers an unconditional 30-day money-back guarantee and a 99.9% network uptime guarantee. What’s more, EzzyTech web hosting plans come with a free domain, free SSL certificates, and free migration services. Furthermore, for every dedicated server plan purchased, the vendor offers a free IP address. The EzzyTech award-winning support team is available 24/7. They are polite and helpful when talking to their clients and their response time is extremely short. Whether it’s by telephone, email, social media, live chat, or ticketing system, this team of professionals gives satisfactory support service to its clients. My conversation with a support rep from this vendor via live chat was fruitful, and I got all the information I was looking for. There is also a fairly detailed knowledge base you can use to find answers to your questions. EzzyTech seems to have invested heavily in the infrastructure and expertise necessary to deliver secure and reliable web hosting services for businesses in Bangladesh and other countries around the globe. The wide range of services and features make it a choice hosting provider for all types of businesses, including startups, WordPress websites, and e-commerce websites that receive thousands of visitors every day. Wondering how EzzyTech Networks stacks up against other Web Hosting companies? Enter any other Web Hosting company and we will give you a side-by-side comparison.